Many people owned specific animals and most of them are dog lovers. As the owner of the dog whether puppy or adult, it is a must to monitor their growth and development. 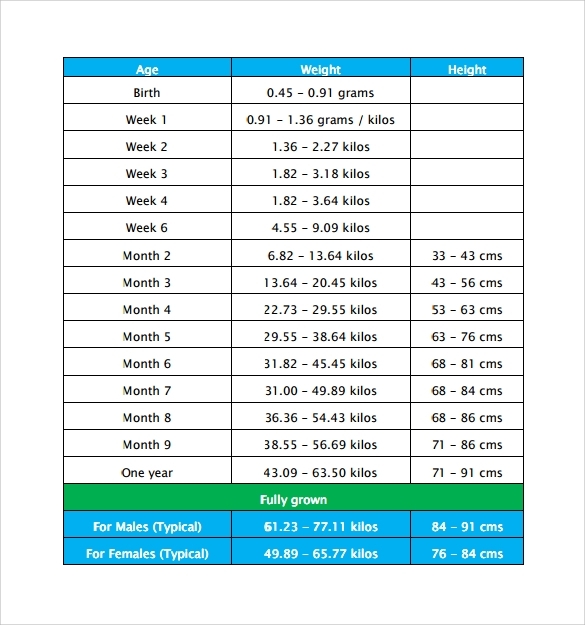 A puppy growth Sample Chart Templates is a useful method to see if the changes happen to a puppy are expected and to calculate also the weight of the puppy. This is also to foresee the future weight of a puppy using the age as a basis and the current weight. The dog owners can get the examples once downloading the template for puppy growth chart in the website online and can be also made in Microsoft word/excel programs. These Chart Templates are free after downloading in a preferred format and ready for printing. Having a puppy growth chart can help people to take care of their puppies accordingly. You may like CDC Growth Chart Templates. Mixed breed pups require extra attention as compared to other breeds. And often information regarding their growth rate is inaccessible. In that case a mixed breed puppy growth chart is very helpful. Since it describes very carefully all the stages related details of a puppy’s growth into a dog. The template is available online for free downloads. The miniature schnauzer puppy growth chart template is a useful chart template for an owner of Schnauzer pet. The chart depicts the age and weight a schnauzer should have by giving instances of various schnauzers. The template is available in various formats for free download. Puppy Growth chart template is a comprehensive growth chart of dogs both males and females. The chart describes the adequate weight a pet should have depending on his age. The chart ranges from the age of pet from birth to a year. The chart template is available for free download in various formats like PDF, Word, etc. 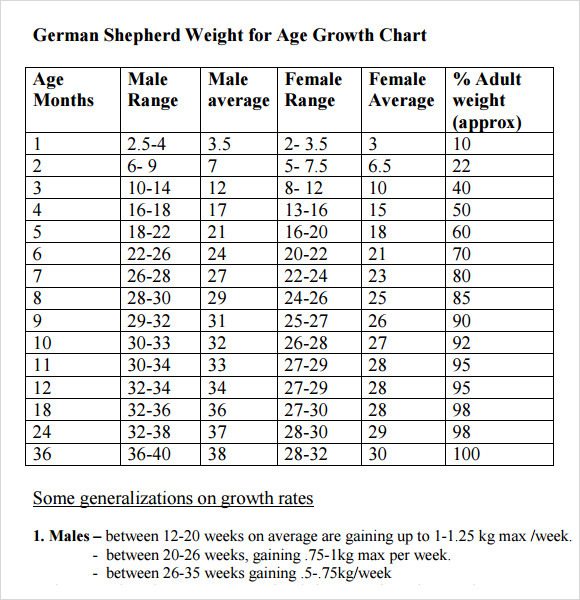 Puppy growth chart template for German shepherds is a template especially for German shepherd dogs. The chart is made in tabular form describing the growth a German shepherd should have from one month to 36 months. The columns are separate for males and females. The growth chart template can be downloaded by you online in various formats like PDF. 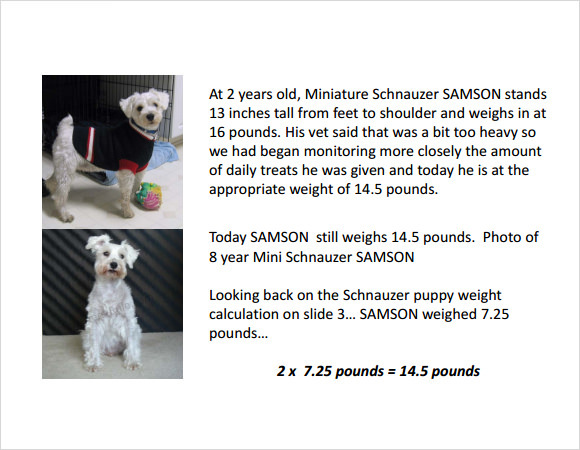 Why do we need Puppy Growth Chart Templates? Dog lovers around the world complain of unconsciously foregoing the needs of their pup, because unlike humans the animals are unable to vocalize their needs. That is why it’s the duty of an owner to keep a regular track on their pet. 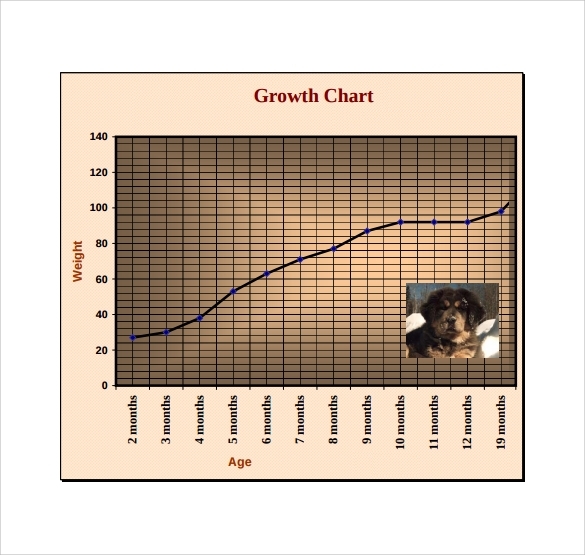 Hence, there comes the need of Puppy Growth Chart Template. It is like a tracking medium to keep a check on your pup’s activities and then recording on a piece of paper. If you own a dog you would definitely need a Puppy Growth Chart template since it’s a perfect way of personalized monitoring of your puppy. You can also see Baby Growth Chart Templates. When do we need Puppy Growth Chart Templates? Puppy growth charts are good way of keeping track over your pet’s growth and development. Just like parents record an infant’s growth, his first tooth, his first stroll, et al same way a pet owner must keep a diary of his pet’s first tooth, his height, his weight, etc. The cause of concern can arise if your pup is not growth growing at a pace at which he should. At that time these puppy growth chart comes for help. They keep a pet owner informed about their puppy’s growth pace. You may like Girls Growth Chart Templates. 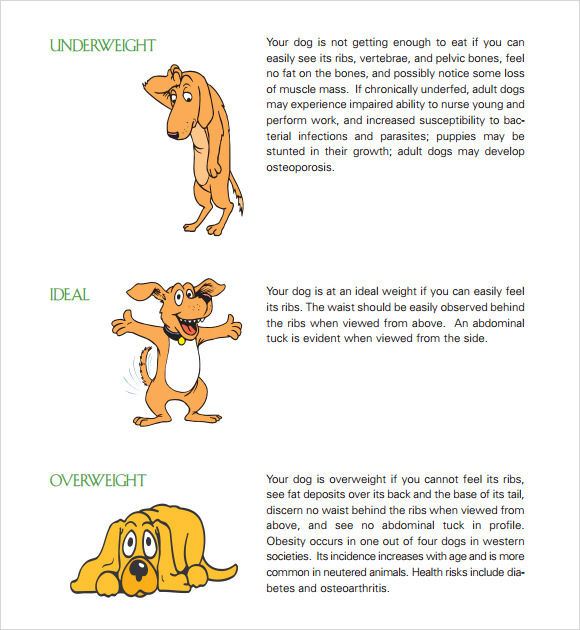 What are the benefits of Puppy Growth Chart Templates? 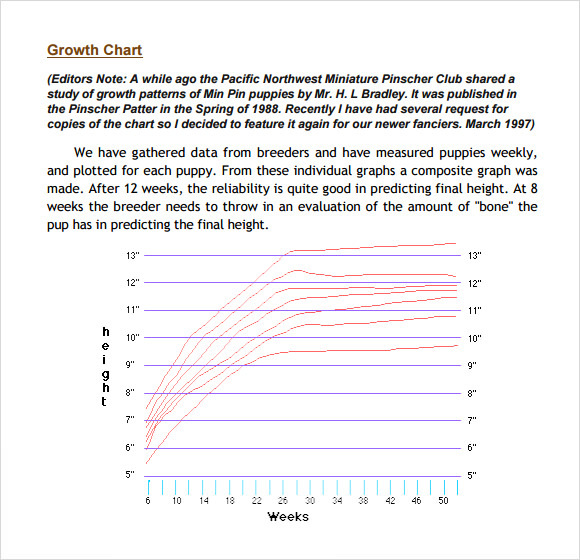 Puppy growth chart templates are a unique way of tracking your pet’s growth rate. You can access the growth rate if you keep a regular record. It keeps you informed, and a pet owner must be informed. Also these chart templates are available in various patterns depending on the breed you have. You may also like Boys Growth Chart Templates. Ranging from German shepherd to Labrador, Puppy Growth Chart templates are available for all breeds. 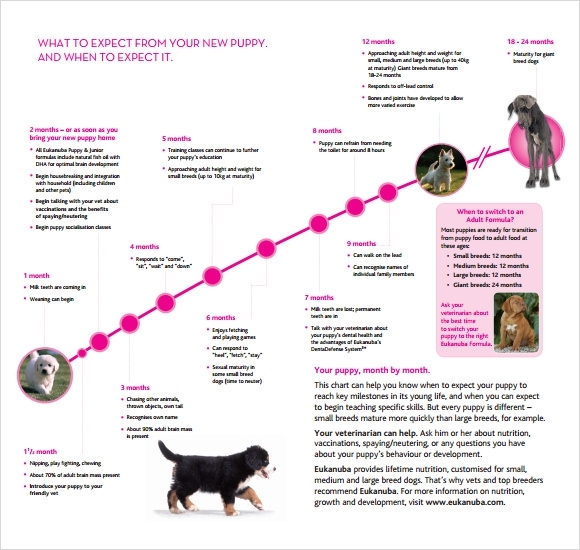 So as a pet owner you must possess a Puppy Growth chart and keep it updated.